I’d like to accept Kerim’s invitation to go with the quasi-orality of blogging and think aloud for a moment, not as hastily as in a real-time interaction, but certainly not as sluggishly as in a peer-reviewed publication. 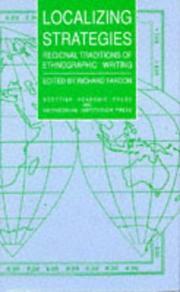 I agree with the need to draw more theoretical inspiration from our ethnographic encounters, and would add to this an often forgotten component of anthropological work, namely regional traditions of ethnographic writing, e.g. see Localizing strategies. Fardon, Richard, ed. (1990). That is, those of us who develop a regional specialisation or two have rich regional traditions (e.g. SE Asia, Europe, Melanesia) to draw inspiration and concepts from and to critique, a middle-range field of knowledge to write for and against. Some theoretical challenges will be commonly found across regions (e.g. internet activism), others will be region-specific (e.g. the cultural salience of notions of ‘malu’ in Insular SE Asia) but not for that reason less worthy of attention. In our efforts to appeal to as wide a metropolitan market as possible, it seems to me that we tend to downplay this crucial regional dimension of ethnographic research – certainly when it comes to theorising for an interdisciplinary audience. The Economist magazine recently interviewed linguist Geoffrey Nunberg about “Words as Data” (http://www.economist.com/blogs/graphicdetail/2012/06/qa-geoffrey-nunberg-linguist-berkeley) dealing with language dynamics, social behavior changes, ethnographics, technology and social sciences. Have you heard the interview? If so, what is your take on it? Thanks in advanced for your reply. Hi Brea. Many thanks for the link; no, I hadn’t come across this interview. I find the idea that words fly together in flocks and the connection of language and social change (e.g. how various -isms arose together in C19) very interesting. His point about the more significant technological breakthroughs in recent years, incl. blogs and social networking sites, being the product of both social and technical knowledge (more so than in past decades) is also intriguing. I think I’ll have to read up on his work!